A National Puzzle Day Event a Few Days Early! Tuesday is National Puzzle Day, aka International Puzzle Day, but as it turns out, a day is simply not enough for the folks at Barnes & Noble. They have been celebrating National Puzzle Month for the whole of January! And tomorrow, January 26th, all 630+ Barnes & Noble stores will be hosting a puzzle contest to celebrate National Puzzle Day/Month! All ages are invited to participate in a variety of puzzle activities with fellow players; complete jigsaw puzzles from start to finish; jump in on a fun word search; or challenge your vocab with crosswords. We’re also featuring Curious Jane activities full of ideas! Participating players will get a free activity booklet to take home—while supplies last. Don’t miss this special offer for puzzle fans: Buy 1, Get 1 50% Off All Dell Penny Puzzles from January 25th to January 27th, in stores only. There’s still time to sign up for their event; check out their Facebook, Instagram, or website for more details. Not only that, but I can tell you for a fact that the puzzles they’re offering for the event itself are top-notch! How can I be so sure? Well, our friends at Penny Dell Puzzles are the ones who crafted those marvelous puzzles for the participants! How cool is that? 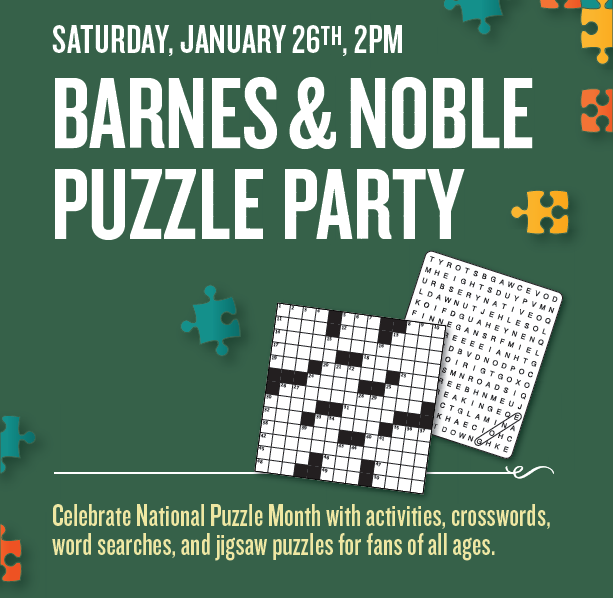 Will you be attending the #BNPuzzleParty tomorrow? Let us know in the comments below! We’d love to hear from you! This entry was posted in Games, PuzzleNation, Puzzles and tagged About Us, Announcements, barnes & noble, barnes and noble, crosswords, games, Geeking Out, Holidays, International Puzzle Day, National Puzzle Day, national puzzle month, Penny Dell Puzzles, Penny Press, Penny/Dell Puzzles, Pop culture, puzzle event, PuzzleNation, Puzzlin' fool, puzzly event, Word Seek, Wordplay by gmdirect. Bookmark the permalink.